Is Audient’s iD44 everything you’ll ever need for your studio? If you're looking for a new audio interface to become the hub of your studio, capable of recording everything from a singer songwriter to a full band, then Audient has you covered with the all new 20in/20out audio interface, iD44. Featuring four Audient console mic pres, designed by audio legend David Dearden, two JFET D.I’s, ADAT expandability, balanced insert and return points and more. The iD44 could well be the perfect interface for recording bands. So you’ve found your recording space, be that a hall or a studio or even your living room, plugged in your iD44 and you’re ready to go. Now what? 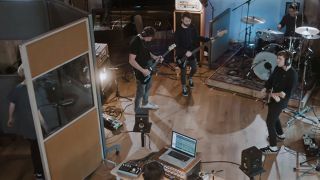 The first most important thing to think about is ‘are the band going to be playing live or are they going to be multi-tracking it?’ Here we’ll be discussing the basics of recording a band, live in the studio. As the musicians are going to be playing at the same time, which is often something that’s genre specific (rock, jazz), then you’re going to need some additional mic pres to get capture the whole band simultaneously. The great thing about iD44 is you aren’t limited to just four channels. iD44’s ADAT inputs mean you’re able to hook up an additional 16 channels of mic pres such as Audient’s 8-channel mic pres; ASP800, ASP880 or something similar. • Record the band live and overdub the vocals after - Often a good vocal performance transforms a good song into a great one. If the band want to record the vocals live, then invest in a great hypercardioid microphone (Shure Beta 57/58 for example) and point the null at the drummer. • Use isolation panels with windows to separate loud and quiet elements of the band and to ensure the musicians can see each other and get the best performance. If possible, place drums/guitar cabs in an isolated room. • More mics, more problems? When using more than one mic you’re going to start running into phase issues. The easiest way to avoid this is to minimize unnecessary mics. Introducing more mics than you need can create comb filtering issues when it comes to mixing, something that’s hard to fix in the mix. The 20 inputs iD44 provides will be more than enough to record the more demanding of sessions, but by all means throw up as many mics as possible and experiment to find out what works for you. • There will be spill and that’s okay! - Sometimes you’ve got to embrace it to get the best recording and mix possible. However, if the spill is causing your mix to sound messy then you can always use a gate to control it. We recommend cutting out sections of the audio where the instruments aren’t playing in your DAW. • Recording vocals live or separately? If you’re recording the whole band live, including the vocals, then you should be matching your mix to the level of the vocals. In most songs, this is the most important element so matching the rest of the track to them means they’re not going to get buried. • Converters matter - Making sure you have an interface with high quality converters is paramount to letting you hear the detail. Therefore something like iD44, which has class leading converters with 126dB of dynamic range, will give you a more honest and accurate translation of your recordings; meaning it’ll be easier to make better mix decisions more easily.